I pretty much look at Carpenters stuff every single night without fail and to be honest, I find some of the prices people want for some items staggering, I just don`t know where they get the prices from, but I guess it`s like anything, you can list it at whatever price you want, but selling at that price is something else. Curious as to why TTR is so scarce though. The prices are as they are in some cases because they know they'll find suckers who will pay them. Shame but it's true. This. People who aren't desperate to sell stuff like this will put a higher price tag on it and just wait. They will take what should be about a $10 market price and bump it to $15 or $20 being greedy, hoping that sentiment will make it worth the extra cash. But two can play that game. If they can be patient, so can we. But two can play that game. If they can be patient, so can we. Ah, but that's just it. "We" are not patient. And by "we", I refer to any fan group or devotee of any subject. We have seen in other threads that there are those among us willing to spend whatever anyone wants to charge for certain items, if they have an affinity for that particular item. So, just because an item has gone out of print temporarily, they jack up the prices to cover other costs or losses. ThaFunkyFakeTation, CARPENTERS-COLLECTOR and leadmister like this. Yep, someone will always bite eventually as supplies become less available. I've seen the cycle with the Offering LP. When there are plenty available for sale, they go for $50-$80 apiece for VG-VG+, but when there are only one or two floating around, they go up to $200-$300. In the case of older albums like this, I can't see how it is worth having it right now to pay all that extra money. With new stuff, I totally get it, because it's never been seen or heard before. I don't know. I guess it depends on the item and the buyer. I tend to be too rigid to pay more for something than I think it's worth, mainly because my stubborn desire to deny them the satisfaction of milking me often outweighs my desire to own that piece of memorabilia. But that's just me. I tend to be too rigid to pay more for something than I think it's worth, mainly because my stubborn desire to deny them the satisfaction of milking me often outweighs my desire to own that piece of memorabilia. But that's just me. me too and the reason I don`t own the 30th and 40th anniversary box-set`, just crazy, ridiculous prices. I don`t mind paying my fair share, but won`t be taken for a fool (and his money). Damn nice find. Can we see some more pictures? What does the other side of the sleeve look like? How about that little white logo up at the top left? My first guess would be an Indonesian bootleg. There was a record company there called Contessa Records and they were known for putting together albums like this that looked like the regular deal but had a bunch of hits shoehorned in among the regular album tracks. They were put out of business in 1988 after being nailed for multiple copyright infringement issues. there is a photo of the album with it, but it`s no different than the one above, so that`s pretty much it till I get it. £15 delivered, what you think? i`m curious, because if these albums are `bootlegs`, is there any real value to them, because by rights, they should never have been released in the first place! Well, bootleg CD's and DVD's are a dime a dozen but bootleg LP's, on the other hand, are pretty rare today, especially one like this. Value depends on what you look at. Money wise, it's worth what you paid for it. The coolness factor is off the charts though. 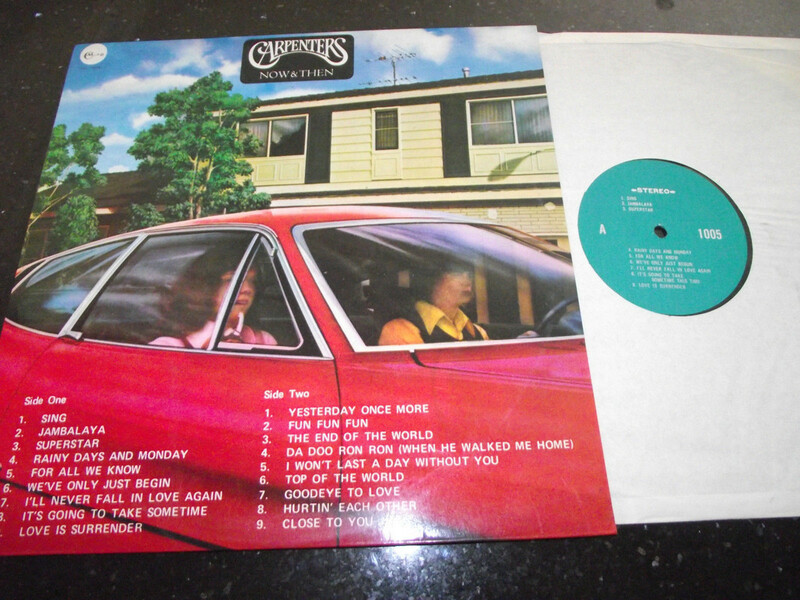 How many Carpenters fans have something like this? Not many at all. The coolness factor is off the charts though. How many Carpenters fans have something like this? Not many at all. I didn’t realize that the Carpenters recorded “Goodeye to Love”! But I wonder what the Oldies medley sounds like, being cutoff after ‘Da Doo Ron Ron’. CARPENTERS-COLLECTOR and Jamesj75 like this. I didn’t realize that the Carpenters recorded “Goodeye to Love”! Looks like a boot to me. "It's Going to Take Sometime"? "Goodeye to Love"? "Hurtin' Each Other"? It appears you've been taken. You know you've got a winner though when the YOM Reprise is listed as Yesterday Twice More. Jamesj75 and newvillefan like this. But who can forget their other great hit : "We've Only Just Begin"
leadmister, newvillefan, ThaFunkyFakeTation and 1 other person like this. On a related matter, about 10 years ago, a friend gifted me with a Horizon album signed by both Richard and Karen, quite an impressive gift for a Carpenters' fan, and my favorite album to boot (requisite pun to follow...). Could this be a "bootleg?" Faked signatures? I've never bothered to ascertain its authenticity. I am happier to proudly display this album in blissful ignorance (a trait that 23andMe suggests I am likely to have). ThaFunkyFakeTation and CARPENTERS-COLLECTOR like this. ok, as a fan and collector, I guess I should know, but I can`t know everything! Whew! I hate to see people get taken by crooked ebay-ers. Glad you aren't one of them. I have to admit, though, that I'd be kind of be interested in a song called "Good Eye to Love". Sounds like a country lyric waiting to be written. Didn't even catch that. LOL! !